"This recording is something I have wanted to do for a long while- a spontaneous session with long time friends playing some of our favorite standards done in a single take with absolutely no overdubs or fixes. What you hear is what you get. We are striving to rise above the songs into a realm where we are ourselves yet coming together as one. Our codas to each song are a synthesis and distillation of the material, our personalities and the moment. I truly hope you enjoy our moments together." Phil Grenadier (trumpet), Will Slater (bass), and Karen Kocharyan (drums). "In the realm of jazz trumpet the music of great performers has taken broadly two paths. The first path is that of Gabriel, the clarion trumpet player of stunning power and technique, perhaps most famously embodied in such musicians as Armstrong, Eldridge, and Gillespie. The other remarkable path is that of the subtly persuasive Orpheus, who (although presumably a string player) exemplifies the more nuanced poignancy of such musicians as Beiderbecke, Davis, and Baker. It is the second path that Phil Grenadier is traveling. I would have a very difficult time coming up with explicit links between the solos of those giants and Phil, but the path undeniably is the same. from Lookin’ Good, Contemporary S7597) and Herb Pomeroy during his last decade (e.g., “Darn That Dream” on Paul Broadnax’ Here’s to Joe, Brownstone 9611). The kind of poignancy one finds in those three solos gives some sense of the gut level impact of a Phil Grenadier solo. And still there is no explicit cause-effect link between the recorded work of Pomeroy and Gordon and the current performances of Mr. Grenadier. 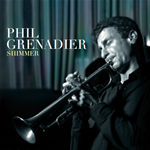 In some sense what is most exciting about the trumpet work of Phil Grenadier is not that he is on the path of Orpheus but that he is extending the path in his own inimitable way. I am enthusiastic about where he is traveling now and where he will carve out that path tomorrow..."